When I was a teenager, I first noticed an old linen chest that my grandmother kept in the basement with a few potted houseplants atop it. The chest was interesting to be because of the elaborate combination lock on the front and the heavy solidity and history of it - I used to imagine that Houdini could have used it for one of his acts, had he been able to lift it. The wood is heavy, difficult to move around, and dangerous in that there is no guard to stop the lid from crashing down on one's fingers. Even so, I've always liked the piece and it has usually found itself in a prominent place in my home. Unfortunately, the damage to the wood veneer from Grandma's zealous houseplant watering left some unsightly blemishes which I covered up with a cushion. I always wanted to get it repaired, but estimates were way too costly and I wasn't sure who to trust with the piece. 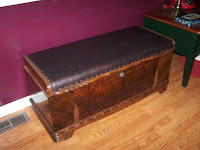 I have no other heirloom pieces, so if this one was lost or ruined I'd be out of my furniture heritage entirely. 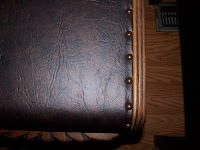 Fortunately, Paul at Paul A Howard custom furniture set me up nicely by upholstering the top with some nifty brass tacks adorning the new leather. 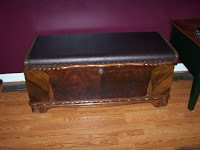 It coordinates nicely with the house, and the leather is grainy enough that even with everyday use it should hold up well. Thanks Paul!